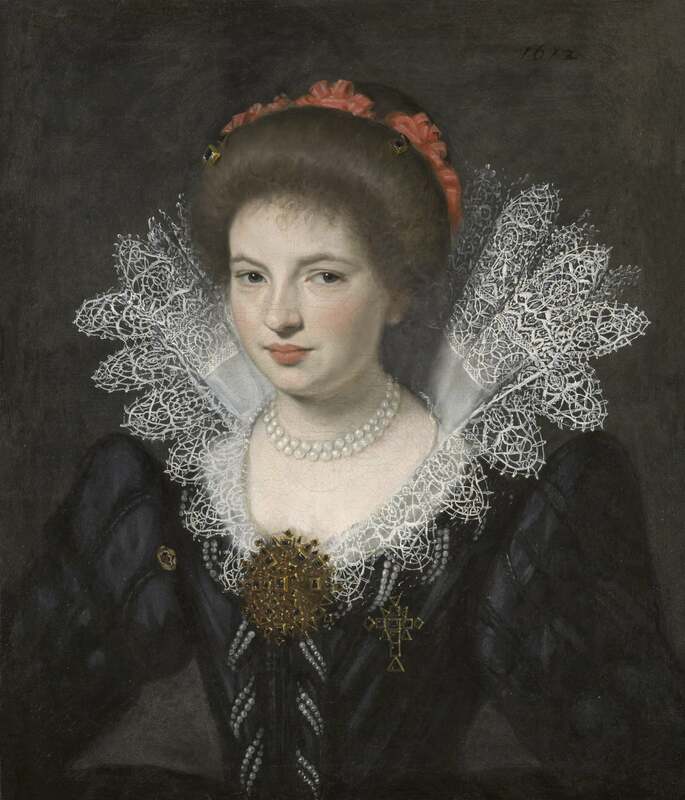 This ravishing portrait of a young French noblewoman can be dated by costume to circa 1612. With her hair tied back in an elegant chignon and framed by a fine deep-standing collar of reticella lace, she is comparable to several portraits by the French artist Daniel Dumonstier, all datable to this period, in particular his portraits of Mlle de Fontlebon and Jacqueline de Harlay, Marquise of Villeroy .The bust-length format and great refinement with which Dumonstier captured the likeness of his models, and the details of their costume and pearl jewellery is very characteristic. Our lady’s sumptuous attire illustrates the cosmopolitan nature of court fashion at this time, with the same style of ruffs, jewellery and silk fabrics present in France, England and the Netherlands alike. She wears a low-necked bodice made of fine Italian silk brocade to which two magnificent brooches of table-cut diamonds are pinned, one in the shape of a pendant cross. Given the wealth displayed, she must have been of the highest echelons French nobility. Needlelace was most popular in costume during this period. Geometric reticella deriving from cutwork was elaborated into punto in aria (called in England ‘point lace’), which also reflected popular scrolling floral designs. Dumonstier came from a family of artists and in 1601 he was appointed painter to the Dauphin (later Louis XIII). In 1603 he became peintre et valet de chambre to Henri IV. His portraiture was in great demand for the fidelity with which he was able to capture his sitter’s physiognomy and the considerable number of surviving crayon portraits bear witness to his great productivity, which included portraits of many of the most famous figures in early seventeenth century France. Though it is known he painted portraits in oils, there are few examples identified today. For a full discussion on the artist’s life and work see Daniel Lecoeur, Daniel Dumonstier 1574-1646, Paris, 2006. Aileen Ribeiro, Fashion and Fiction, London, 2005, p. 31.